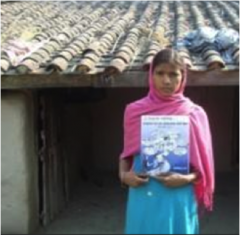 For eighteen-year-old Sitara Bano Bagban, living in the rural village of Karamohana, Banke District in Mid-Western Nepal, educational opportunities were very limited. Extreme poverty along with conservative cultural beliefs, that require male family members accompany females outside the home, as well as extreme poverty had prevented her from getting a formal education. This is not uncommon in rural Nepal where families often depend on their children to stay at home and work to augment income. Since married women are sent to live in their in-laws’ homes, parents traditionally give priority to educating boys who will stay in their parents’ house. Those without an education in Nepal have few options. Without the ability to read and write they are less likely to use government services or send their children to school. Also, their ability to find gainful employment or own and operate successful businesses is hampered by the fact that they are not able to do basic mathematics, leaving them vulnerable to being cheated in the market because they are unable to count money. Everything changed for Sitara when her parents allowed her to enroll in USAID’s Education for Income Generation (EIG) project, which provides income generation training as well as basic literacy training to underserved groups. Because her brother also began to attend EIG’s entrepreneurial literacy class and agricultural training, her parents agreed that she could participate because she would have someone to accompany her. The EIG Project, which is implemented by Winrock International, has trained 74,000 disadvantaged youth (78% of whom are women) to increase their income through employment and agricultural production. EIG uses a market-driven approach consisting of four basic activities: a nine-month entrepreneurial literacy course; demand-driven vocational training tied to job placement; high-value agricultural training linked to markets; and scholarships for people from low castes (dalits) for professional certificates that lead to employment. During the class, Sitara learned how to read and write and how to use a calculator. She learned proper health and nutrition practices, peacebuilding skills, and how to access loans and other government services. 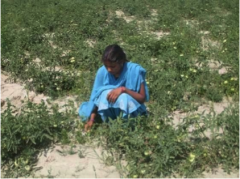 In addition to literacy, Sitara enrolled in EIG’s agriculture production training where she learned how to produce off-season, high-value vegetables including nursery development, integrated pest management (IPM), micro-irrigation technology (MIT), and post-harvest handling. As a result, Sitara convinced her parents that MIT could increase their farm’s productivity. Because she was able to attend this training her family decided to install a small well and pump and which have allowed them to grow fresh vegetables for their home and to sell in the market. Sitara’s income has increased significantly and Sitara has even been able to save a little money at the local saving and credit cooperative. Sitara’s story is just one example of the impact this type of training has had on thousands of disadvantaged youths. These programs prepare young people to be more involved in their governments in a positive way, to get jobs that improve their country’s economy, and to ensure a better and brighter for future youth.